The leaves and petals are arranged as triplets (“tri” meaning three) in this genus. A single stalk supports the trio of ovoid (“ovatum”) leaves that taper to a drip point to shed excess water. Above the triplet of leaves rises the prominent white, three-petal flower with six yellow stamens. The long-lasting flowers gradually turn pink and then red-purple. When the petals at last are shriveled, the three-parted ovary has matured into a plump, ridged seed capsule that splits open upon maturity. Attached to each brown seed is a morsel of food for ants, enticing them to carry the seeds to their burrows. The ingenious method of plant dispersal is an example of mutually beneficial partnerships between the plants and animals in nature. The broad leaves persist through summer, using the dim filtered light of the forest floor to store food in the underground bulb for next season’s bloom. Perhaps because the sight of early spring trillium blossoms is enchanting, at least one Native group uses the pounded bulbs a “love medicine.” In another Native group, a woman who wishes a man for a lover drops a cooked trillium bulb into his food. Far less romantically, several other Native groups use the juice of the bulb as an eye medication, and the scrapings of the bulb to bring a boil to a head. Information courtesy of “The View From Springbrook Park; an Illustrated Natural History” by Ed Chinn. 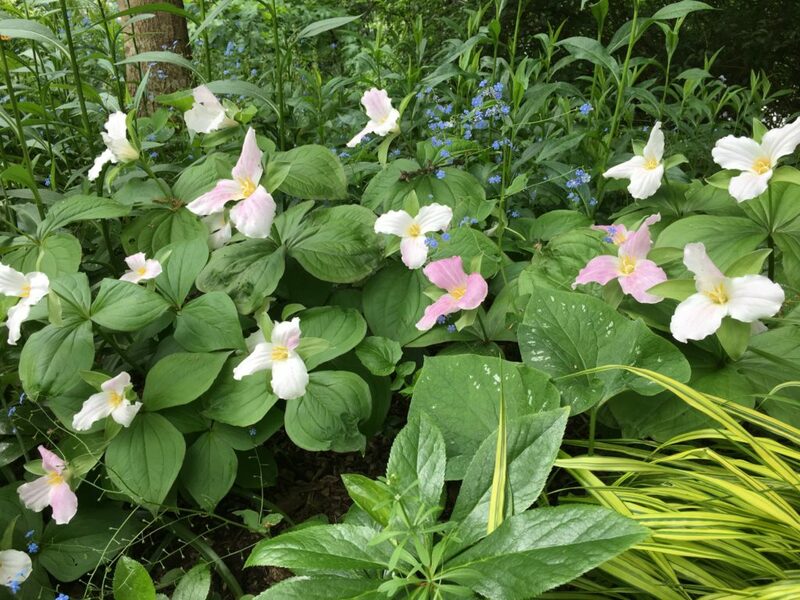 This entry was posted on September 1, 2018, in Flora and tagged trillium. “Rubus” is the Latin name for blackberry and is likely derived from the red (“rubus”) color of both immature fruit (blackberries are red before they turn black) and mature fruit (such as the bright red of ripe thimbleberry and raspberry) of this genus. The flowers occur in loose clusters of four to eight and have five white petals around the central stamens and pistils. 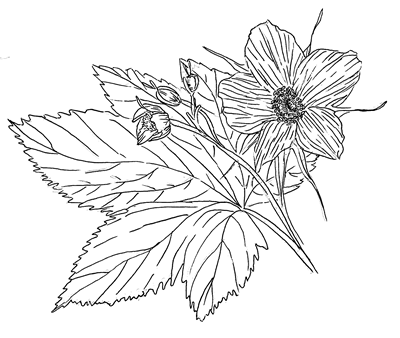 Compared to the denser flower clusters of related species, those of thimbleberry may seem relatively sparse (“parvi”) of flowers (“florus”), thereby explaining the specific name. 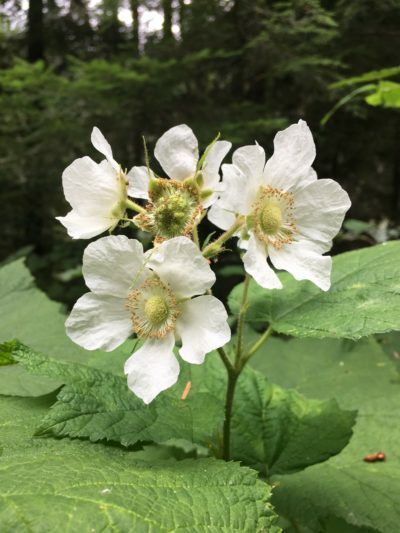 Thimbleberry stands erect to a height of three to seven feet in sunnier locations of the forest, proudly displaying its broad, light green palmate leaves. Thimbleberry plants like other raspberries spread by underground stems, and may form a small thicket in favorable conditions. The lack of thorns and sweet red berries encouraged widespread harvesting among Northwest Native groups. The berries could be eaten fresh, or dried and stored. In early spring, the young sprouts were consumed as vegetable greens. The broad leaves were used as a wrap for cooked berries. 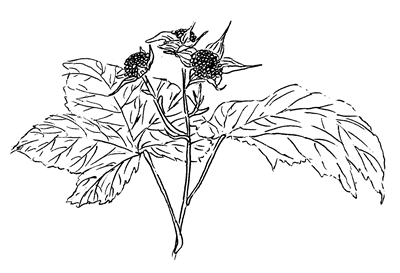 Thimbleberry had other diverse uses, such as using boiled bark for soap, powdered dry leaves to prevent burns from forming scars, and leaves for a tea to treat anemia. This entry was posted on August 29, 2018, in Flora.